In FY2017, a key focus of Emmbi is being sustainable through Sustained Business Growth, Sustained value creation for Stakeholders & Responsible Business Practices. Healthy YOY growth in Revenue, EBITDA & Profitability. Development of a specialized operating processes, which is very hard to copy. Launching of an innovative product: “Aroma Lock” - a specialized Aluminium Liner that is especially useful in sealing the aroma of products like coffee. Widest pond liner launched by Emmbi is proving to be a game-changer in the water conservation industry. The company is increasingly shifting focus towards a more profitable B2C segment of the market from the B2B market, where it has a predominant presence. Emmbi is engaged in large CAPEX & their capacity is going to increase by 30% before next quarter end. 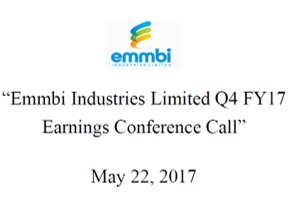 Emmbi’s Q4 revenue stands at INR 66.80 Crore & FY revenue at 240.98 Crore. Emmbi has registered a QOQ revenue growth of 12% & YOY revenue growth of 10.7%. EBITDA grew at 25% QOQ, however, YOY growth is a modest 11%. PAT & EPS registered a healthy growth of 20% YOY, however, QOQ growth is modest 10%. The average rate of interest of present outstanding debt is around 10%. Emmbi has their own foreign currency hedging policy & does not have to worry too much about the rupee appreciation (until it becomes 30-40%), unless and until other global currencies do not act in tandem with that. In this FY, interest cost reduced to 3.44% of the revenue from 4.15% last year. Emmbi still is in the purview of MAT & they will have one more year under MAT. Actual payout tax for the company is 18%, rest is deferred tax liabilities. Emmbi is targeting at least 75 to 100 basis points improvement in EBITDA in FY2018. The company will be working on getting down the debts during this next couple of years from the surplus cash and making the company’s balance sheet stronger. Emmbi has created a specialized & unique operating processes, which is very hard to copy and will deliver sustainable competitive advantage to the company. Emmbi Innovation Lab, played a very instrumental role in developing new products & new processes. The company has products into four principal ranges: Specialty packaging, Advanced composites, Water conservation and Agri polymer. Three to four breakthrough products launched in these product categories. One of the innovative product is “Aroma Lock” - a specialized Aluminium Liner that is especially useful in sealing the aroma of products like coffee. Another product is 13-1/2 feet wide pond liner, which will improve the yield, lessen the number of joints, defects, percolation & water loss and will also save a lot of manpower. Emmbi is in the process of a large capacity expansion, by almost 30% of existing facility. A part of that capacity expansion was a positive pressure clean room, which is basically a solution for food and pharmaceutical packaging, & will be completed around June 21, 2017. Total 6000 metric tonnes of additional capacity will be installed which includes 3600 MT for water conservation and 2400 MT for food and pharmaceutical packaging. Emmbi spent little below Rs.25 Crores and increased the capacity by around 40%, which would have a buyback period of around three years. Emmbi dedicated FY2016 to blue collared employees. In the FY2017 key focus of Emmbi will be Sustainability. 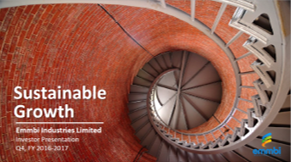 Emmbi defined sustainability in three principal aspects: Sustained Business Growth, Sustained value creation for Stakeholders & Responsible Business Practices. The company aspires a multi-locational and a multi-geographical presence & added two more countries to their distribution network taking it to 54 countries. Another focus area for Emmbi is the arena of manufacturing growth through the Make in India initiative. In the first year of Production, newly Launched Pond Liners have recorded a business of 650 Ponds with a capacity of 130 Crore litres of water & is expected to grow at the CAGR of 145%, around 10000 ponds by 2020. This product has contributed 3.5% of the revenue (B2C) this year & is expected to contribute to 25 % of the Revenue of the Company by 2020 & will significantly change existing distribution profile (B2B:B2C) of the company. Better profitability is because of the better utilization of the capacity plus the better contribution of the value-added products in their product profile. Revenue percentage from export operations reduced a bit, however, export business volume doesn’t suffer. This is because of revenue growth in the domestic market from B2C vertical. Emmbi is strategically targeting high margin B2C segment. Emmbi will require maintenance CapEx around 5 Crores per year in next two years and no major capital expenditure is required during this period of the time. If demonetisation would not have happened and the market would have been in a similar range, probably instead of 10% growth in revenue, Emmbi would grew around 15%. Emmbi is targeting around 20% improvement in the toplines in 2017. Emmbi had used 92% of installed capacity last year and by adding a new facility it has come down to around 70%. As projected growth rate for next 3 years is around 20%, CapEx will be done when usage of existing facility will be around 90-95% range. Emmby is not really affected by the price of crude, with the 30 days cycle time, adequate inventory & non-speculative operation. Focus on food & pharma grade packaging is American manufacturers because the requirement of this kind of highly clean or highly contamination free packaging in India is very limited & more required in the western country. This is an export focussed advanced composite product. Emmbi is able to charge a premium in their pond liner business because of the superior technology which delivers both in terms of durability & size. Amazon & Snapdeal are among the customers of Emmbi e-commerce packaging solution. Global business is improving & overall market scenario also good. Government is strongly pushing water & agri-polymer segment, so it looks pretty decent. Domestic packaging is not as aggressive as it was because there is a bit of a slowing down happening in the domestic market. Emmbi along with Owens Corning of US & Texel of India, are the top three players in the pond liner business. Food grade packaging market is growing rapidly as any ingredients or any inputs, which are required for the human consumption during the process need this kind of packaging. Competition is there as manufacturers from China, Turkey & India are competing for this market.